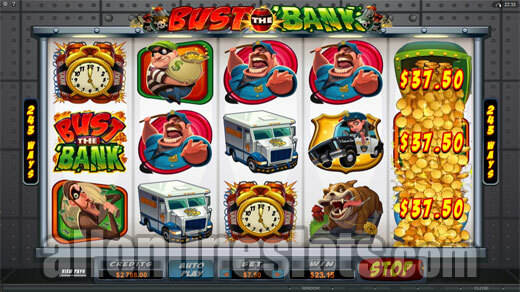 Bust the Bank is a 243 ways video slot machine from Microgaming. 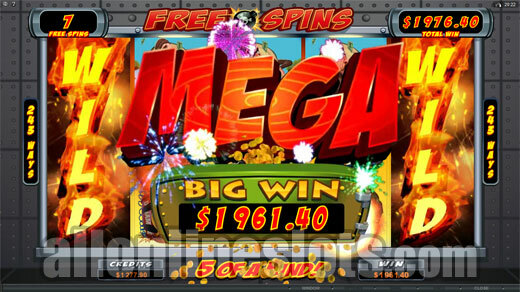 The game features a free spin feature where reels 1 and 5 are wild as well as a range of random bonuses that can award up to 100X your total bet or 30,000 coins. 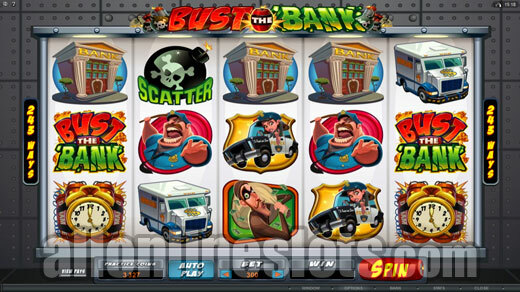 Bust the Bank is a 243 ways slot by Microgaming that has a comical cops and robbers theme. 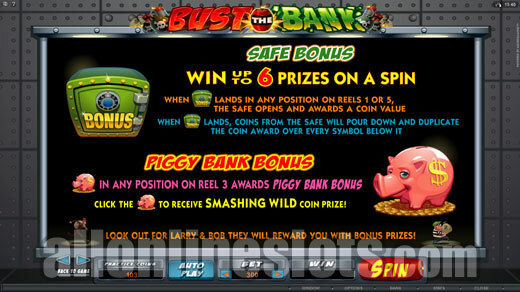 The game has a range of bonus features including free spins with wild reels and random bonuses which can pop up at any time. 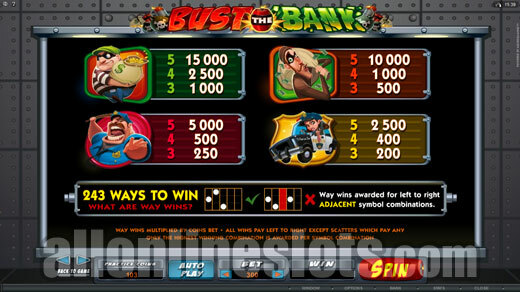 You can play Bust the Bank in a very wide range of coin sizes and have the option of betting up to 10 coins per line. Minimum bet is 30 coins with a minimum coin size of 0.01. At the highest 1.00 level you can bet up to a big 300 per spin. 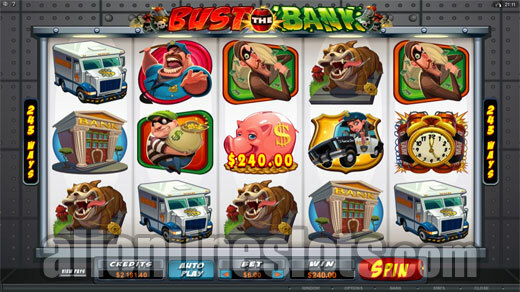 The Bust the Bank logo is wild and substitutes for all symbols except the scattered Bombs, the Safes and the Piggy symbol. The wild only appears on the first and last reels so there is no way to get five wilds. They can still come in very handy as you can get the same win on multiple ways if you get the wilds in the right positions. Top way wins are 1,500 coins (*15,000 at max bet) for five of the Big Robbers (Bob) and 1,000 coins (10,000 at max bet) for five of the Skinny Robbers (Larry).From there the five of a kind way wins range from 500 to 50 coins (5,000 to 500 at max bet). 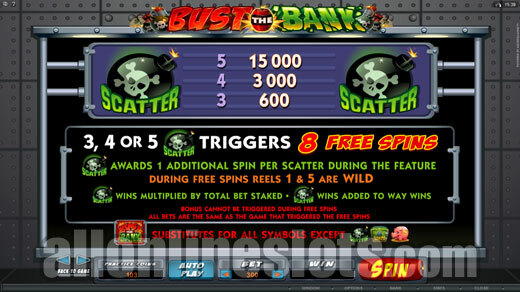 The main bonus on Bust the Bank is the free spins which are won by getting three or more scattered Bomb symbols anywhere on the screen. The five scatter pay awards 1,500 coins or 15,000 coins at max bet which is the same as the top way win. As long as you get three or more you win 8 free spins with wild reels. During the free games reels 1 and 5 are wild for all games. This means that any five of a kind win is paid nine times. This boosts the top jackpot to 13,500 coins even at the lowest possible bet of 30 coins. At the highest this comes in at 135,000 coin which is the biggest win you can get on Bust the Bank. 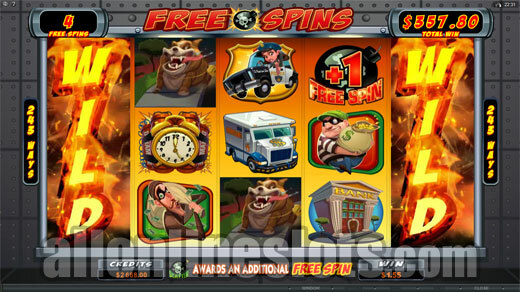 The free spins cannot be re-triggered but you can get extra free spins. Every time a scattered Bomb appears during the free games you get one extra free game. This means you can get a lot more than 8 games if you get lucky with the extra scatters. 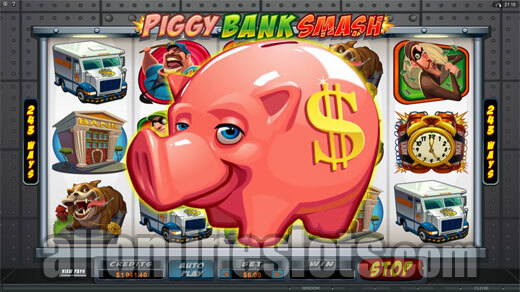 The second bonus on Bust the Bank is the Piggy Smash Bonus. This bonus is won every time the Piggy Bank symbol appears on the middle reel (View Preview). When the bonus is won the piggy bank is smashed and you win between 10 and 100 times your total bet. During our review we found that this bonus was quite rare to hit. As well as the two main bonus features there are also a couple of extra ways to win. There are Safe symbols which appear on the first and last reels. Getting one in any position awards between 1 and 50 times your total bet. The Safes also cascade so if you get on at the top of the reel the bonus is paid on all symbols below. The final way to win on Bust the Bank is via the random Larry and Bob bonuses. These can appear at any time and have nothing to do with what's on the reels. Each time they appear they can add between 2 and 10X your total bet. 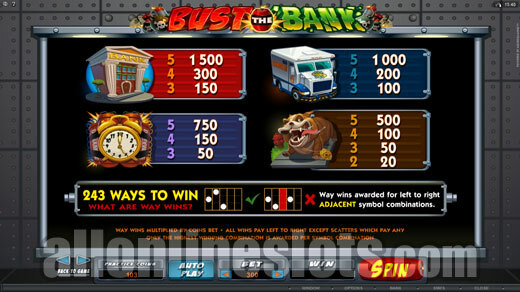 In the end, Bust the Bank offers quite a few different ways to win and keeps things interesting with the random bonuses. Clearly the free spins have the potential to pay big but we found that they were quite hard to hit so this probably evens things out.